Apple on Monday provided registered developers with a new round of betas for its forthcoming desktop and mobile operating systems, releasing both OS X Yosemite Preview 4 and iOS 8 Beta 4 as over-the-wire updates. iOS 8 Beta 4 comes with a number of known issues that affect a wide variety of the operating system's components. iCloud backups may not restore properly to an iOS 8 device, for example, while FaceTime will not work in landscape orientation. Notably, location-based recommended apps will no longer display on the lock screen, though it unclear whether the feature has been removed permanently or only for this beta release. Apple has also removed the Bug Reporter app in iOS 8 Beta 4, directing users to file bugs through the Apple Developer website. Other services coming with known issues, bug fixes, or both in the latest beta include AVCapture, CarPlay, CloudKit, Contacts, Document Providers, Extensions, Family Sharing, the iOS file system, Find my Friends, Fonts, Game Center, Handoff, HealthKit, iAd, iCloud Drive, iCloud Keychain, Keyboards, Localization, Messages, Metal and OpenGL, Music, Newsstand, Notification Center, Phone, Photos, Safari, Siri, Springboard, UIKit, Weather, and WebKit. OS X Yosemite, meanwhile, brings a somewhat smaller but still daunting list of known issues and fixes. Developers are warned that iCloud Drive will not synchronize with earlier preview versions, and Aperture versions older than 3.5.1 will not launch. Other areas of interest in OS X Yosemite Preview 4 include CloudKit, Extensions, Family Sharing, Finder, Handoff, iBooks, iCloud, iPhoto, Markup, Phone Calls, Safari, SMS, and developer tools. 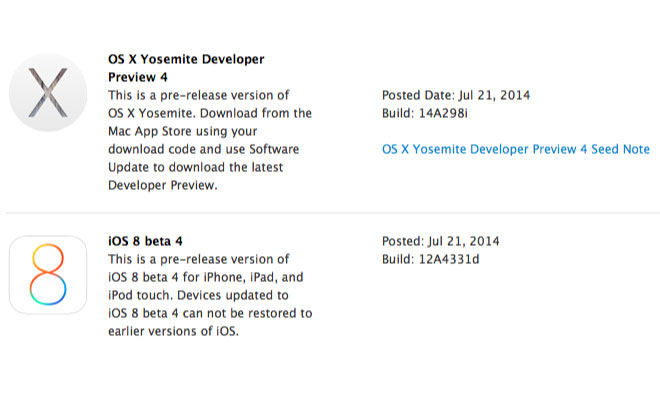 Developers running an earlier preview of OS X Yosemite can update through the Mac App Store, while those with devices running beta versions of iOS 8 will find a 305-megabyte delta in Software Update. Both updates are also available in the Apple Developer Center and come with Apple's now-customary warning against using preview software in production systems. Also receiving beta updates Monday were Xcode, Apple Configurator, and the Apple TV.